My family and I stayed here our first night out in Rome. We originally booked our trip through Tripmasters and were assigned this hotel. We took a shuttle service from the airport to this hotel, which took about 45 minutes. ENTRANCE: Very small door you easily miss. Our shuttle driver found it for us and dropped us off right in front. Otherwise we would have missed it. Also, you need a passcode to enter the building. If you donâ€™t have one, ring the buzzer or wait until someone enters or leaves the hotel to come in with. RECEPTION/FRONT DESK: Located on the second floor of the hotel, I believe. You can take the flight of stairs from the entrance or the tiny elevator. If you have a lot of luggage, try to take turns making your way up and down the elevator. There will be a sign once you exit the elevator leading you to the front desk. Checking in was very quick and painless. However, they do charge a city tax, which you will have to pay in cash. I forgot how much they charge per day, but I recommend putting some cash aside. You can pay as you check-in or check-out. Theyâ€™re very flexible with that. They also provide you with the wifi password and passcode to enter the hotel as they hand you your giant room key. ROOM: My room was on the 3rd floor of the hotel with two windows facing the city. The view was marvelous, I love how the windows can open out and you can stick your head out and just stare into the city. Itâ€™s my favorite part of the room. The room itself its very small and completely covered in this Italian styled tapestry, it felt almost like a chamber. There was a small table in the center, 3 small beds, a small television, a small coffee maker, mini fridge, safe, some closet space, and an ac unit placed by the ceiling (works pretty well). The bathroom was very small, but the shower was really nice. It had a couple of cool functions to it and the water gets hot FAST. I definitely enjoyed taking my showers; however, the bathroom smells heavily of a strong disinfectant smell. It became too much at one point and made me feel kind of nauseous. The walls arenâ€™t soundproof, so you can hear movement and conversations outside of your room, even the city in the morning when theyâ€™re doing construction. The beds are pretty comfortable. I slept pretty well in them, so I donâ€™t really have any complaints. I like how they try to conserve electricity by using your room key as a switch to turn the lights on and off. Also, beware of using too many of their electrical outlets because we kind of burnt it out and had a small power outage in our room but we managed to fix that shortly. BREAKFAST: It isnâ€™t complimentary here, so we opted for eating out at nearby cafes. Thereâ€™s plenty of food options down the street anyway! LOCATION: Iâ€™d say itâ€™s very convenient because itâ€™s 5 minutes from the Trevi Fountain and about 7 minutes from the Spanish Steps and the huge shopping area. Getting to The Vatican, Colosseum, and other attractions are a bit far, but if you donâ€™t mind the walking then go for it. CONCLUSION: Overall okay stay. They get all the praise for being in a prime location and the view from the hotel window is stunning. Beds are comfy, only complaint is the strong disinfectant smell that is constantly lingering in the room. I would honestly stay here again given the chance. **Small side note! Water is cheap here, only 0,50 euros from the vending machine! My wife and I stayed here last year and the service was great. Nothing has changed. Service great and hotel has a very intimate feeling. On our arrival my wife and I were greeted with a "welcome back" and happily had our room upgraded at no cost. Thank you. This hotel used to be a Monastery (about 400 years ago) and has all that charm. I love the elevator! !...Nuns still live in the building....our room had a terrific typical street view across via Tritone. Its only a short walk to Trevi Fountain, Spanish Steps and other attractions and literally 100's of good restaurants. Our favourite being "Thats Amore" virtually across the road and has become our regular in Rome. Concierge organise tours and taxis for us all without a hitch and generally at better prices than I could get anyway. When checking out the owner referred us to a restaurant in Nice, owned by a friend of his...Thank you for a lovely stay, we look forward to coming back. We were pleased with our stay at this hotel. The rooms were very clean and the staff was friendly. The hotel was affordable and in a great location. It was just a short walk away from Trevi Fountain and not far from the Spanish Steps too. Our wifi worked well during our stay. I was only unimpressed with breakfast. You are given vouchers to a nearby restaurant which entitle you to one coffee, croissant, and orange juice. Stayed here 4 nights for the 6 Nations, 10 people in 5 rooms. Room was beautifully decorated, and spotless. House-keeping came everyday. 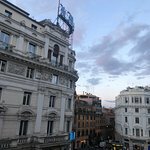 Hotel is central, close to Trevi Fountain, Spanish Steps, plenty of bars and restaurants. Stayed here 2 years ago, and will stay again. Just back from our 2 night stay here and was lovely and quiet and bed nice and comfortable. Trevi Fountain about 10 minute walk. No iron in rooms though. Would stay here again. Con Artists everywhere in Rome.